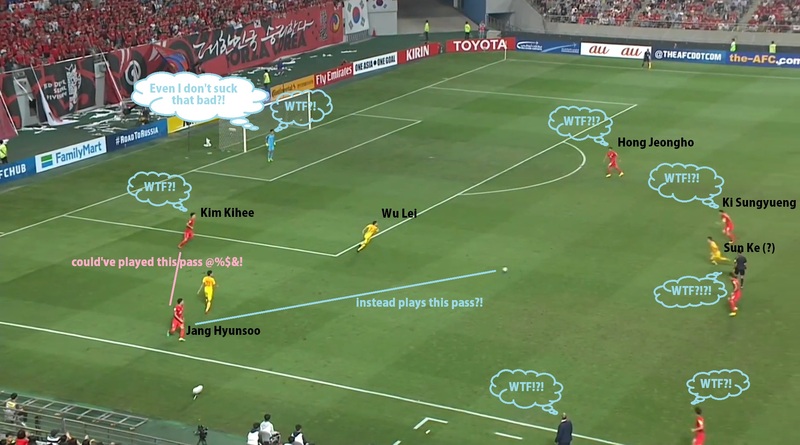 A picture-laden analysis of Korea’s 3-2 win over China in World Cup Qualifying. Despite all the rumours swirling pre-game that Stielike was going to line his side up with a false 9 striker – Koo Jacheol or Hwang Heechan, instead, it was a much more conventional lineup. Ji Dongwon was the striker of choice, while Han Kookyoung came in for a defensive midfield role. China, as predicted, lined up in a 5-3-2 formation, leaving star winger Wu Lei to play as one of the two centre-forwards. Gao Hongbo had to sacrifice many of his star player’s assets in exchange for defensive solidity. As largely expected prior to the match, China sat back and basically told Korea “come at us”. Possession for most of the first half was 75-25 in favor of the Koreans. The Chinese obviously felt that a more open game would penalize them because of the technical superiority of the Korean side. Understandable, as this is often a winning formula against Korea. 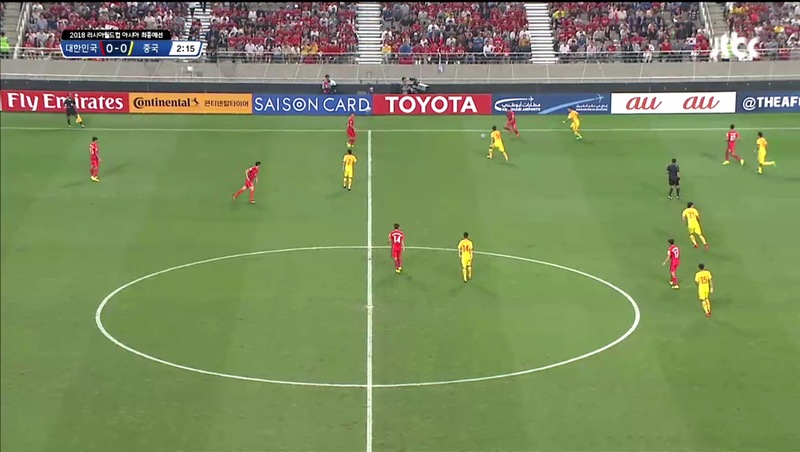 Gao Hongbo’s challenge was to keep his side defensively compact in a narrow 5-3-2 formation, hoping that Korea would not be able to take any opportunities and maybe allowing the Chinese to launch a quick counter should the game continue without opportunities being seized upon. 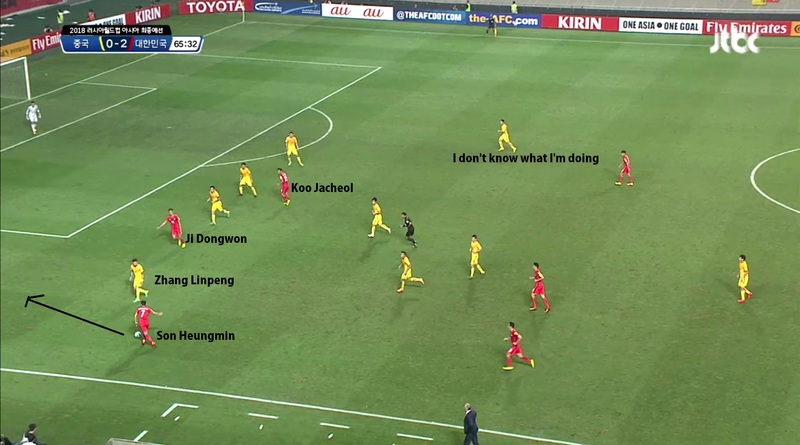 Korea, on the other hand, played what was a fairly traditional 4-2-3-1. When asked on Twitter if this was a standard showing for the Korean national team, the answer was a fairly resounding “yes”. However, if in previous games, Stielike attempted to deploy Ki Sungyueng as more of a #8 instead of a #6, in this game, we saw a far more conservative Ki, being asked to play less of an influential role. This was for two reasons – firstly, because Han and Ki were often asked to drop between the two centrebacks to outnumber the two Chinese forwards. They were not “pressing”, but their presence didn’t allow the Koreans to control the game from central midfield. 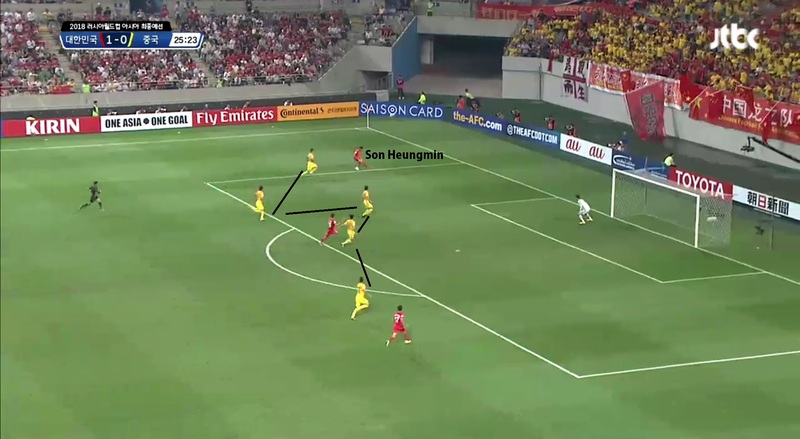 Instead, Han and Ki either distributed the ball to wide players, or provided cover for one of the centrebacks to do so. And because of that, the first reason is intrinsic with the second. 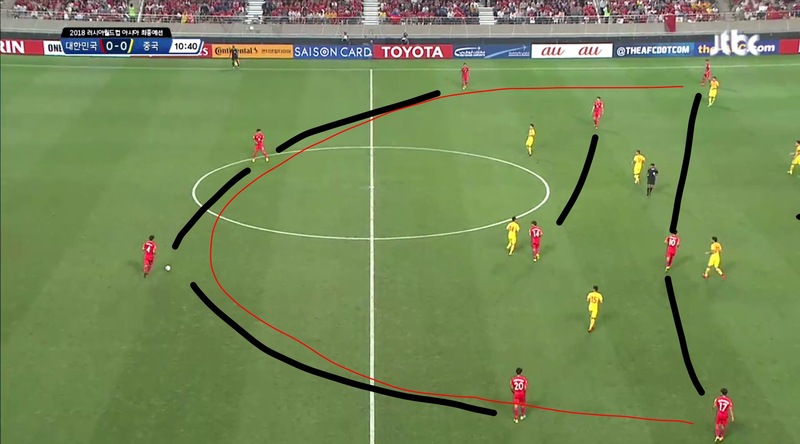 In the below image, in addition to showing Korea’s 4-2-3-1 shape, the red line represents the majority of Korea’s build-up, in a U-Shape of sorts. 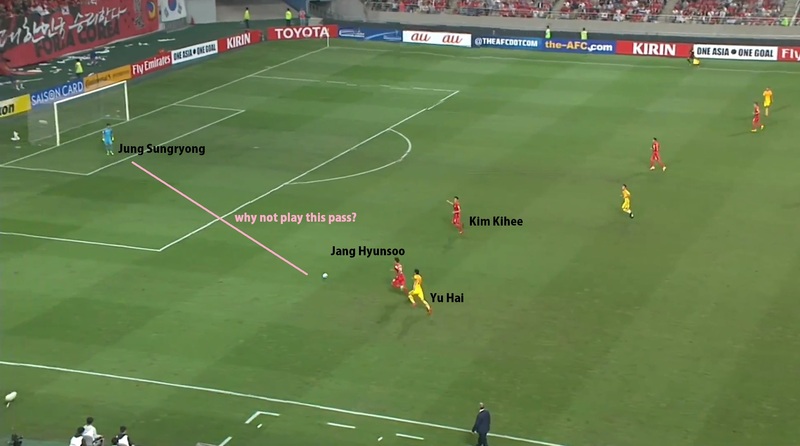 As such, Ki Sungyueng didn’t have much to do because of Korea incessantly bringing the ball into wide areas and relying on fullbacks + wingers connecting to break into the final third. Ji and Koo got far more touches moving into wider areas. When he did make it into an advanced position, there wree few occasions where he would be able to receive a pass because of Chinese players marknig him. Notice the gaping hole in midfield. 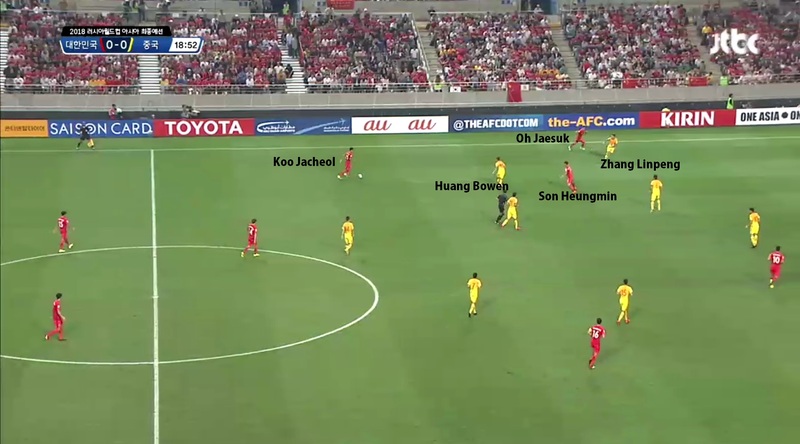 Koo Jacheol’s movement out of a central role and Ki Sungyeung drifting out wide. Furthermore, Son Heungmin (out by the red Kirin sign) is playing in a very wide role, compared to his position against the Honduras back 5 during the Olympics tournament. Furthermore, Koo Jacheol often shifted from side to side, or dropped into an area where he could often pick up the ball without Chinese players tightly marking him – the “half-spaces” on either side of the midfield. Korea’s first goal came off of a set piece, but it’s the build up that led to the goal that is more noteworthy. Koo Jacheol’s dropped into midfield. The Chinese right midfielder Huang Bowen doesn’t immediately come out to mark him, for fear of leaving Son Heungmin (behind him) alone. Oh Jaesuk is making a run in behind Zhang and by the time the Chinese right wingback reacts, Oh is well in his stride. As a result, Zhang has no other choice but to pull Oh down, just outside of the penalty box (though the ball was already in the box). The subsequent free kick. 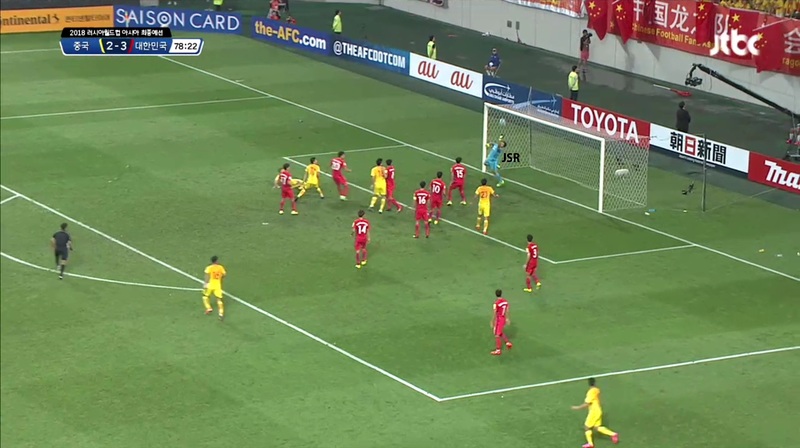 China is employing a zonal marking system with a two man wall. 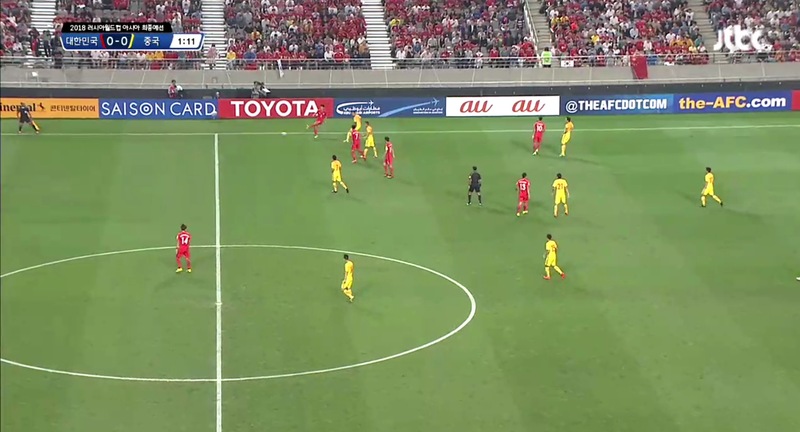 Jang Hyunsoo and Ki Sungyueng look slightly offside, but as the ball is delivered, it seems that the real problem for China here is how slow they are out of the gates. Perhaps they are expecting a looping ball instead of the pacey, header-level delivery of Son. Ji Dongwon gets a flick on it and ultimately it’s Zheng Zhi who can’t get his foot out of the way. Although the goal did not come from open play, it’s still refreshing to see Korea score on a set piece. Right after scoring the first goal, Korea were definitely seeming like they were prepared to score a second. Another similar set piece was set up on the right side, and Son’s delivery was excellent – header-level, quick and accurate. 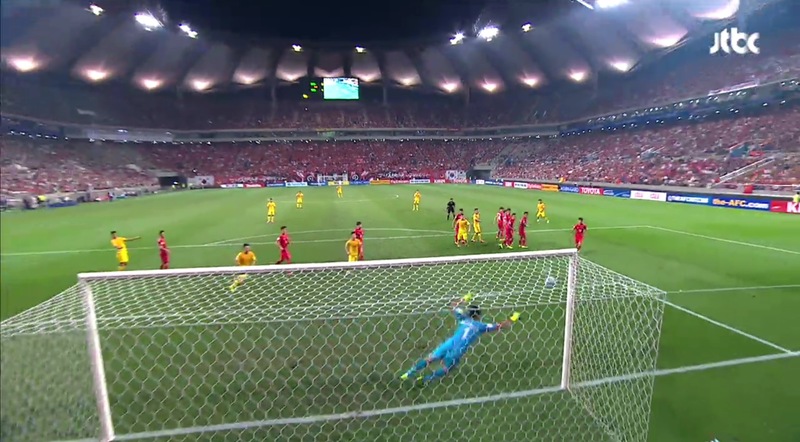 Ji Dongwon’s header on this occasion, however, didn’t take a touch and went decidedly wide. 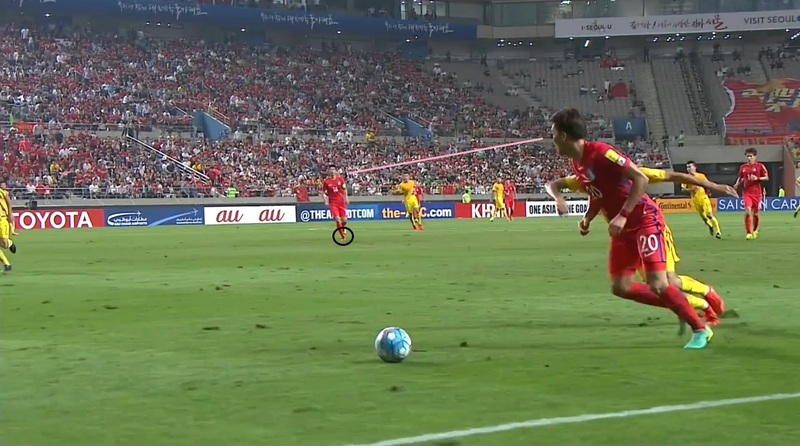 A few minutes later, it was Oh Jaesuk’s turn to make a decisive pass – spotting Son’s acceleration, putting some distance between himself and the Chinese right wingback. However, Son’s indecision in a tight area led to his shot being promptly blocked, as was a Koo Jacheol opportunity after the Chinese mismanaged the transition in their own half. Son’s indecision of what to do, combined with Ji Dongwon not timing his run into the box better, means nothing comes of it. 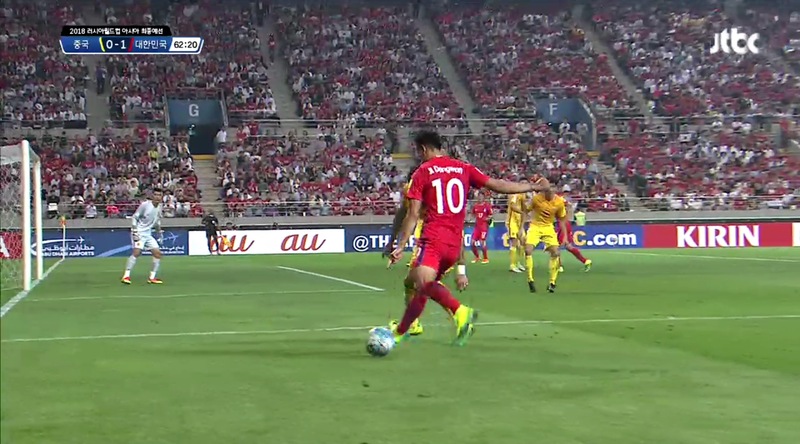 Finally, in the 26th minute, China’s rightside was exploited again – midfielder Huang Bowen and that same right wingback, Zhang Linpeng, were marking Son and Oh Jaesuk respectively. The hesitance of Huang to step into Oh when the Korean leftback got the ball allowed him the time to float a cross into the box. It was headed away but fell to Lee Chungyong, whose volley soared into the seats. 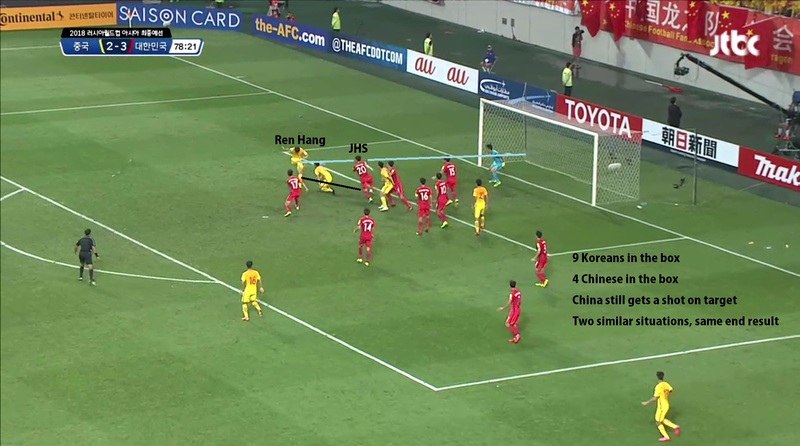 Despite the missed opportunities here, it was perhaps a sign on China’s part of what Korea is so often vulnerable to – mental lapses of concentration when conceding the first goal. The Taeguk Warriors weren’t really doing anything much differently – width and wing-play, as I described above, is pretty much how they were approaching this encounter. The Chinese defenders were simply giving them more to work with as they began to show signs of nerves. As the home side finally begun to see holes to poke in China’s defensive shape, the same could be said for the visitors. He and Son dialed into second gear, and the former Korean captain tried to play a pass to Son, who was bursting into the channel in behind China’s 3 midfielders. 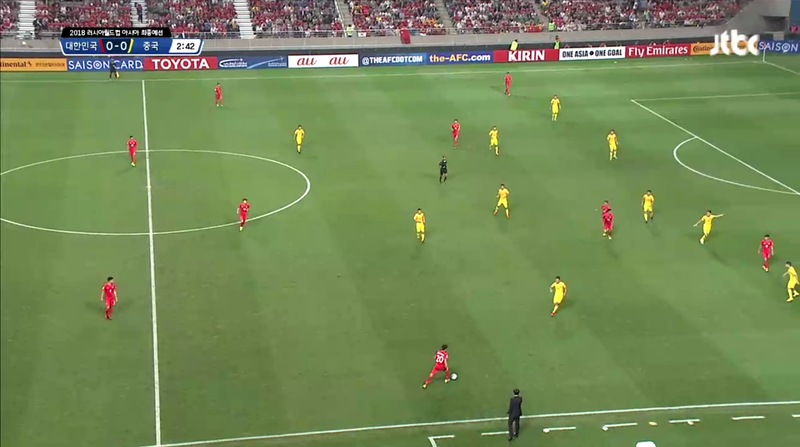 However, they weren’t on the same page and Chinese central centreback Zheng Zhi got the ball. 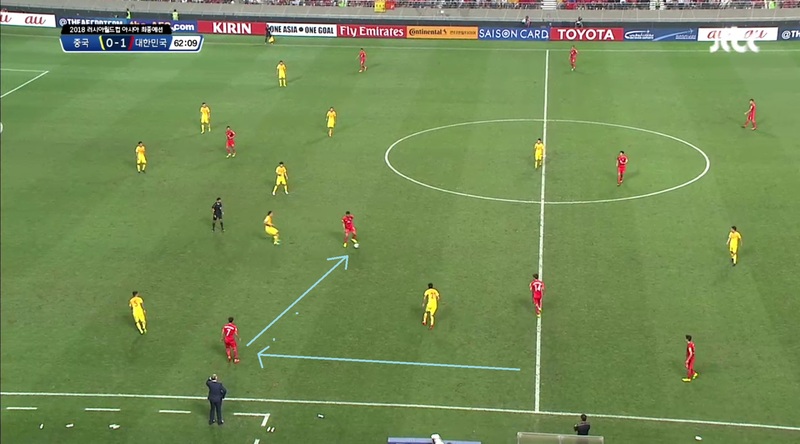 Because Koo was out of position, there was plenty of space for a couple of passes before Yu Hai releases Wu Lei’s run. I couldn’t get a better screenshot of after this one here. Wu ultimately doesn’t take a great touch and Hong’s slide tackle blocks the shot and the ball into touch. 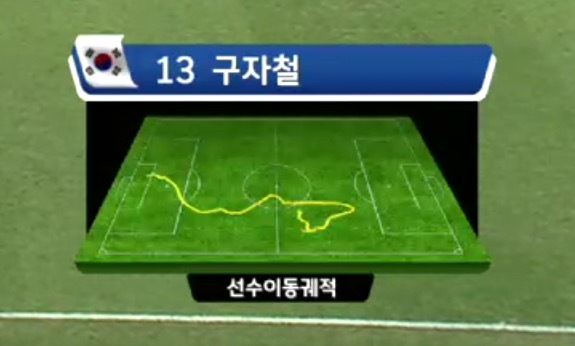 As the half evolved, Korea began to use the middle of the pitch more. 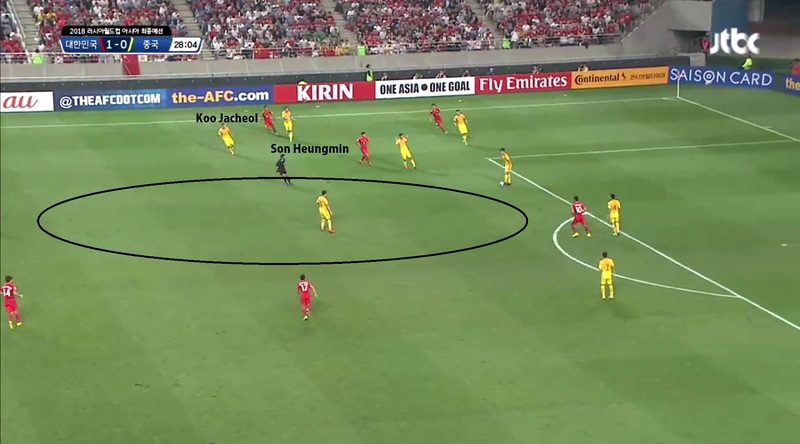 Ki Sungyueng began to move into more of an attacking role while Lee Chungyong especially played much deeper than Son in order to establish more numbers in midfield. That being said, the emphasis remained on Koo and Ji wing-play. 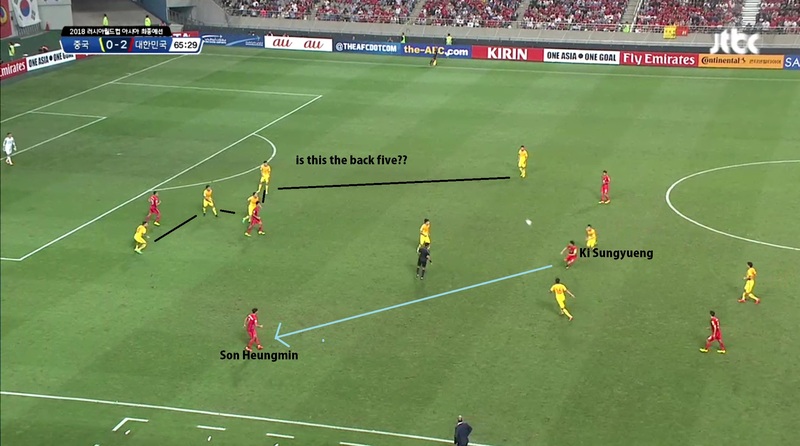 And now, for our favorite “WTF” moment of the half – this basic, basic mistake by Jang Hyunsoo. Jang’s chasing down a free ball. Yu Hai is pursuing him. Kim Kihee is pointing at Jang to play a simple pass to Jung Sungryong. 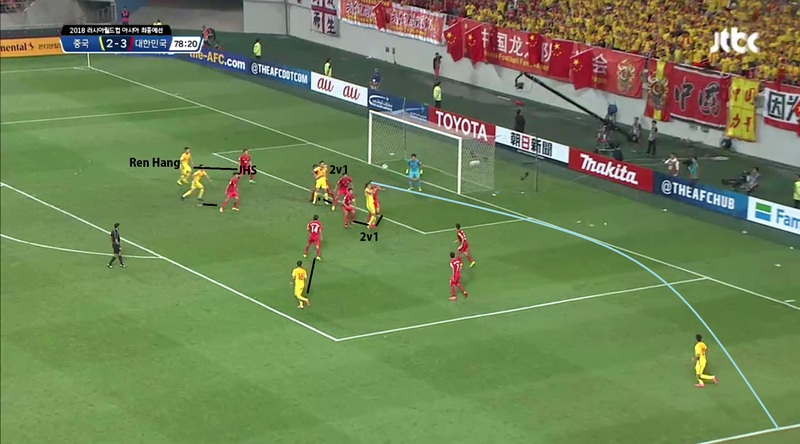 Of course, the pass is underhit, and Sun Ke has a simple interception and then Wu Lei throughball to play. I couldn’t resist the additional thought bubbles. 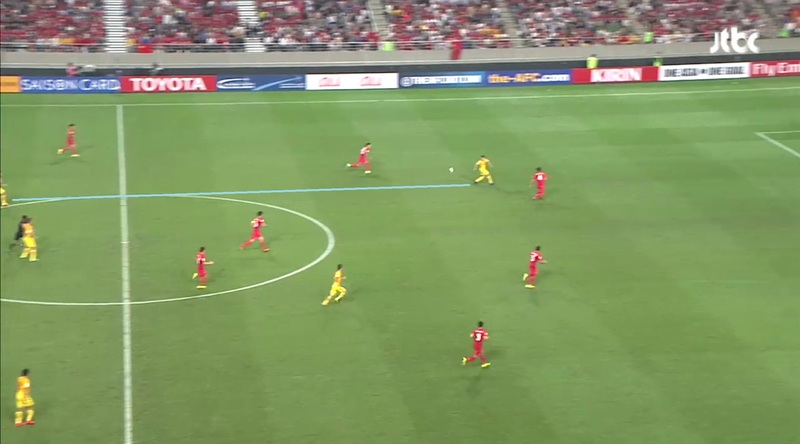 Very, very fortunately, Hong Jeongho’s pressure forces Wu to rush his shot, which is scuffed and rolls wide. In sum, the first half was largely a bore. Korea stuck to wider areas, congested by China early on, but eventually there were some openings. Although the lead was only one goal, Korea’s 70%+ possession including the couple of unconverted chances, led us to believe that any defensive frailty would go uncapitalized. China didn’t seem to “have a goal in them”. That said, the Chinese own goal forced China to change their gameplan in the second half, as their defense-only approach couldn’t get them the wanted draw. Indeed, the Chinese back five – still a back five for the moment – was playing slightly higher up than the first frame. This, combined with a Korean team shaking off some early nerves and rust, meant the second half started with both sides looking to play far more of a free flowing game. The Taeguk Warriors, though never building their attacks for long up the middle, looked more for Koo Jacheol’s aerial presence and one-touch passes from central roles. Since there was more space to work with in the middle, the Augsburg man not having to retreat into a deeper or wider role to pick up the ball anymore. Korea connected on their first two blows of the second half. Lee Chungyong and Koo Jacheol scored similar goals to bring Korea’s lead to 3-0. Ji Dongwon has come deeper. Son Heungmin isn’t tightly followed and the wide areas aren’t stifled like in the first half. 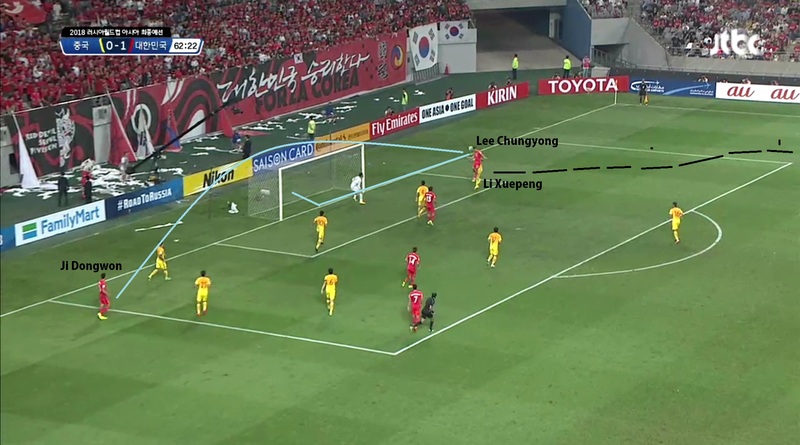 Lee Chungyong’s been following the play on the other flank and rises above Li to head the looping ball home. The Chinese defender was actually jumping away from the play, clearly unaware of Chungy’s presence. Defensive laxity from China, 2-0 Korea. Then, a 3-0 just minutes later. 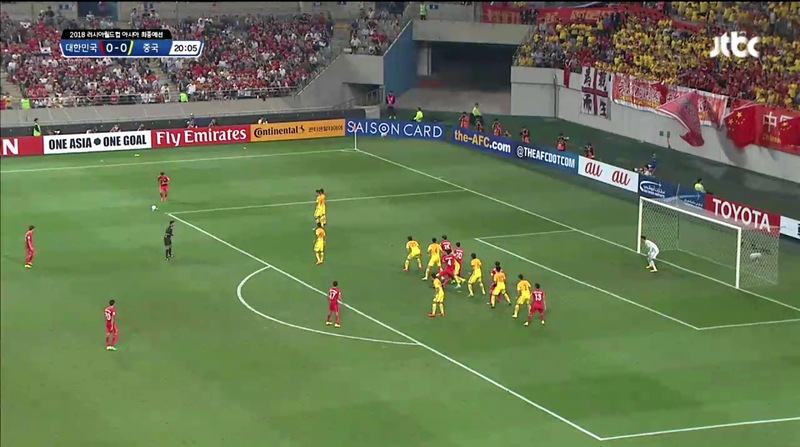 Jung Sungryong’s long goal kick is headed away by a Chinese defender (I think Zheng Zhi). Ren Hang does everything he can to get to Koo but it’s to no avail. Takes a touch, goes off the post and in. 3-0 Korea. You’ll actually notice it was a simple but pretty sweetly timed double diagonal run that brough Ji and Koo into their goalscoring positions. The final bit of Koo’s movement chart before the goal shows the decisive run. Korea seemed set to sail through the rest of the match, but the minor defensive errors here and there that China never seized upon persisted. 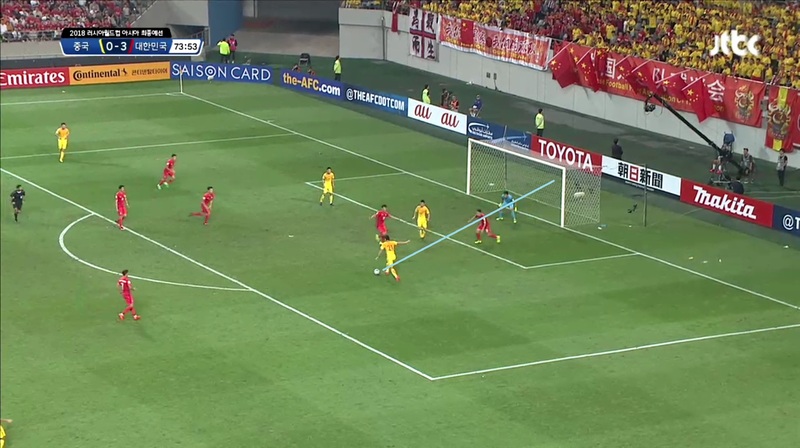 Then one major mistake – Ki Sungyueng’s clearance is right at a Chinese player, who floats a cross in in the 74th minute..
There’s a clear 3v2 depicted by the yellow and red lines. Kim Kihee was pointing and gesturing but forgot about the day job – following his marker. Yu Hai smashes the ball home. A lot of people would instantly blame Oh Jaesuk for the mistake here, and with good reason. Obviously, Oh should have just gone for a safer, backwards header and conceded a corner kick. That being said, a player of Ki Sungyueng’s calibre shouldn’t be making basic errors just as mishit passes in our own final third – followed by a classic case of ball watching – him and Kim Kihee. The responsibility for this goal is shared, and coming together of a flurry of individual mishaps gave China a surprising opening into the match. The second Chinese goal also seemingly came out of nothing. 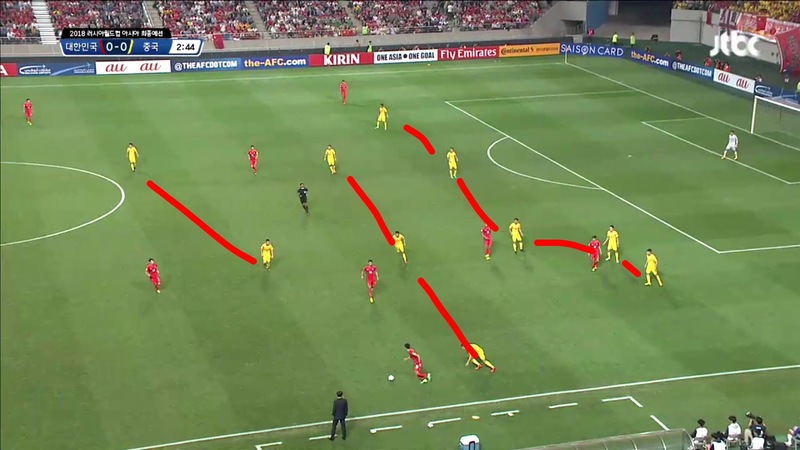 A stretch pass was played from deep as the Koreans’ midfield legs began to tire. Wu Lei has got the ball, but Kim Kihee looks like he’s got him covered. Jang Hyunsoo is tracking back. Jang decides to challenge Wu, who, knowing he’d still have Kim Kihee to beat, obviously takes the easy option and falls over easily. Is it a foul? Soft one, but Jang does make contact. Hao Junmin, who came on at halftime and took all the set pieces, lines this one up and scores well. 3-2. It wasn’t by any means a “perfect” free kick, but it doesn’t take a perfect free kick to beat Jung Sungryong. We all know that being athletic in these kinds of set piece positions isn’t part of his game. China almost got a third, and from a very similar scenario to something that caused the Korean defense trouble earlier in the game as well. A throw in from the left side. There are two 2v1 scenarios in Korea’s favour, but somehow we still screwed it up. Two headers (both 2v1s) are won by the Chinese player. 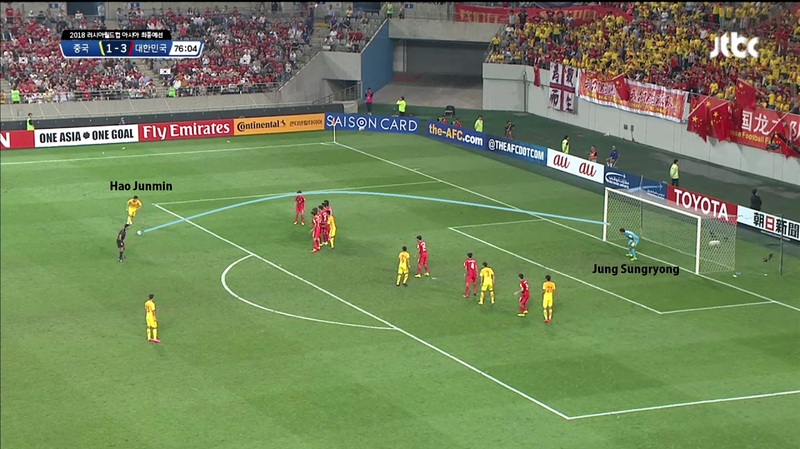 Jang Hyunsoo somehow so easily loses his marker in a 6-yard box scramble and Ren Hang takes a shot from close range. Luckily, this time Jung makes a nice save. I’ll talk more about Stielike’s performance in a later post, but this is one grievance I want to air now. I don’t think any of the substitutions he made were illogical ones. Hwang Heechan came on to replace Koo Jacheol ; Lee Jaesung came on to replace Lee Chungyong ; then at the death, Jung Wooyoung came on to replace Son Heungmin. They all made sense. Hwang’s pace up front would prevent China from comfortably passing around the back and set up an attack, unsettling any player looking to play a longball. Lee Jaesung has lots of energy but also has some defensive ability + is unafraid to get stuck in, making him a reasonable sub for Lee Chungyong. Both these players’ substitutions were justified in the minutes after they were made. The question is indeed why they were made until after the game became 3-2. Hindsight is indeed 20/20, but surely in the 75th minute, with two Chinese changes already made, it made sense to bring out tired players for fresh legs while the pressure wasn’t on. This way, China would be uncomfortable at the back and more error-prone. Unsettling them with pressure doesn’t give them any confidence to work with. Instead, Korea switched off after the third goal with the same 11 players who started the game, expecting to coast to a win. Football is a 90 minute game, and I think Stielike forgot that you gotta make subs during the 90 minutes even if you’re ahead. Because if the opposition is playing the full 90, anything can happen. The final change? Jung Wooyoung as a third central midfielder, the team temporarily shifted to a 4-3-3/4-5-1 of sorts. Again, a very logical move on paper as know we have high-energy players creating problems higher up the pitch, and an extra defensive presence playing ahead of the fullbacks further down the pitch. China never really got an opportunity after the Jung save, which speaks partially to the sub’s effectiveness, but also simply running out of time. Korea hung on for a 3-2 win that had started so brightly and positively, but ultimately left a bit of a bitter taste in the mouth. Jung Sungryong – 6.5 – All things considered, a good performance from Jung. Distribution decent, that big save crucial. Justified his starting selection, even if he couldn’t make that save on the second Chinese goal. Oh Jaesuk – 6.5 – Does one individual mistake (and it never should have gotten to him anyways) cancel out 89 minutes of excellence? In player ratings, yes. But let’s not forget this performance at all – Oh also justified his starting spot. Lively, worked hard (ran the third most kilometres of any Korean player), defensively for the most part adequate. Deserves a re-call if starting regularly for club. Kim Kihee – 5 – The partnership with Hong Jeongho just doesn’t work. Never really sure what his role is. The key of a good centreback pairing is balance and chemistry. If Hong is playing as the last-ditch centreback, Kim needs to play as the aggressive centreback. There wasn’t any of that kind of balance nor any chemistry here today, and if China can reveal that, there’s kind of a problem at hand. Jang Hyunsoo – 4.5 – Jang had a very poor game. Errant passes and contributed nothing in attack. He can’t play rightback as far as I’m concerned. He just can’t do it. May be better off moving Oh Jaesuk to rightback once KPA leftback options come back to light. Han Kookyoung – 6.5 – I liked Han in this game. He did a simple job, showing players out of touch, covering for fullbacks who pushed up a bit, making simple passes out wide and continuing play. His physicality was pleasing to see, but the referee called a lot of soft fouls on him, making it difficult for Han to legally play his no non-sense kind of game. Ki Sungyueng – 5.5 – A weaker performance from Ki. A couple of uncharacteristic individual mistakes. Lost when moving up (I know I said that thing about Korea not looking to play in the middle too often, but I don’t think he got any touches when he moved parallel to Koo in the centre). Doesn’t mean we should suddenly drop him, just a weaker game. He’ll improve and have better days. Son Heungmin – 7 – Deserves a lot of credit, involved in some capacity in all three goals. However, I still think he tries to do a bit too much at times and his positioning isn’t always the best. Despite that, China was clearly scared of him and his acceleration especially caused them problems down their right side. Koo Jacheol – 7 – Made a strong bid for staying as CAM, even if Korea opted to play in wider positions for most of the game. Koo still got involved, scoring the goal, and his one-touch killer passes were a surprising feature to his already known skills – coping well with China’s physicality and winning battles in the air. Lee Chungyong – 6.5 – Tired near the end and should have been subbed out sooner, but Lee did a lot of the dirty work compared to his fellow winger. Came deeper to create midfield superiority. Despite the goal (he only ever scores with his head!) looked a bit rusty. Ji Dongwon – 7 – Involved in all three goals as well, including two assists and a kind-of goal (officially credited as an own goal). Question remains about what he offers as striker. Suk: physicality. Hwang Heechan: pace and energy. Ji: a measured mixture of both? I guess it’s his asset and downfall. Not particularly quick or dynamic, but solid, works hard and causes problems even if he’s only drifting wide. Made some good runs, though the chemistry wasn’t really there with other players. Not to take away from this performance – a magnificent surprise. This post was a bit more analytical in nature. Tomorrow I’ll look at criticism Stielike is receiving for his handling of the match and whether or not it is warranted, as well as delve into perhaps a couple more individual performances I want to highlight. FYI, I feel that there were two principally inaccurate things in my analysis… Firstly, Ki did sometimes move into a 4-1-4-1 role at times, though less often than perhaps in other games. This may be because HKY is less of a distributer than Ki’s previous partners, including JWY & KCH. That said, he did indeed not get very many touches of the ball despite running the most kilometres of any Korean player (alongside Koo) which speaks really to the fact that they were ping ponging back and forth from one wide area to the other, as per the game plan. Secondly, it wasn’t really a “traditional” 4-2-3-1, though it’s such a flexible formation I’m not sure what a “traditional” 4-2-3-1 really is. In any case, LCY came deeper far more often than SHM to create midfield numbers and as I mentioned above, Ki did sometimes move parallel-ish to Koo. So a 4-2-3-1/4-1-3-2/4-4-2 in defense is probably more numerically accurate. Thanks for the analysis Tim! I’m glad we pulled through a W. Defense looked really shaky near the end. Hopefully we can fix things for the away leg. 1 out of 10 matches done for Korea.